I got the idea for a birthday-related post from Richard Robinson at Tip the Wink. 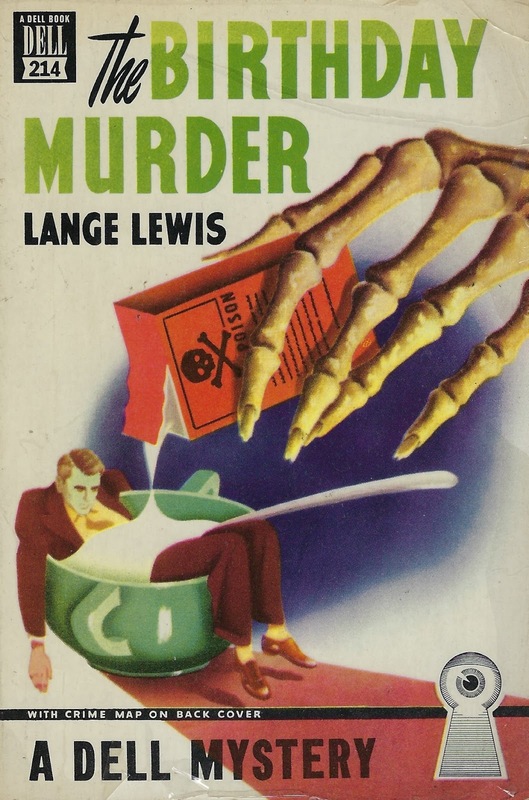 Two weeks ago, he posted a review of The Happy Birthday Murder by Lee Harris on his birthday. Because my birthday was earlier this week, I decided to follow up by reading and reviewing The Birthday Murder by Lange Lewis. Victoria Jason Hime is a successful screen writer and novelist. Her most recent novel, Ina Hart, has been bought by a film studio and her second husband, Albert Hime, who is a producer for B films, may get the opportunity to produce the film version, which will be quite a coup for him. The afternoon we meet Victoria, she has three visitors at her lovely home in Beverly Hills. The first is Moira Hastings, an actress who very much wants the title role in the new film. Victoria thinks she is much too young for the part. Next is Bernice Saxe, who has been Victoria's closest friend for many, many years, since they were in school together. This afternoon Bernice is seeking counseling for her relationship problems. She wants to leave her husband for a man who cannot support her and isn't really interested in a relationship. Victoria, of course, tries to dissuade her from that course. Later Sawn Harriss, Victoria's first husband, shows up out of the blue, ten years after their divorce. One gets the feeling that he would like to take up where they left off, but he had not realized that she is currently married. In the evening, Albert and Victoria share a dinner that the maid, Hazel, has prepared in advance. This is a Thursday ritual, because it is Hazel's day off. They have a pleasant evening alone. And the following day will be Victoria's 35th birthday. Unfortunately, Victoria wakes up on the morning of her birthday to find her husband dead in his bedroom. The cause of death is ant poison, and this mirrors the plot in Victoria's novel. Lieutenant Tuck investigates the crime, but takes nothing for granted. His partner is E. Byron Froody, devoted to following up on details, the perfect legman. I enjoyed this story immensely, and especially the setup, getting to know the characters. The story is revealed primarily from Victoria's point of view, as she takes in what has happened in her life and realizes that the evidence points to her as the murderer. But each character has issues and prejudices that affect the outcome, although we don't get really close to anyone else in the story. The book felt very modern to me, possibly because there were many surprisingly current attitudes expressed. The ending totally surprised me, but was consistent with the story and the clues. Although a lot was made of where the poison had come from and who had opportunities and such, it was really all of the interactions of the various characters that kept me engaged with the story. I had forgotten that Lange Lewis was a pseudonym for Jane Lewis Brandt. She wrote four other mysteries and I believe they all feature Lieutenant Tuck. See other reviews at Clothes in Books, Tipping My Fedora, and Ed Gorman's Blog. My paperback edition is a wonderful copy; it is a Dell mapback AND the front cover features the hand of a skeleton. Source: I purchased this book in 2014. Tracy, this book sounds very good. I love the fact that the couple is named Albert and Victoria and the maid - Hazel, really? Of course, the TV show about Hazel was after 1945. A belated happy birthday to you! I'd not heard of this author. Sadly, my local libraries don't seem to have this book, but one never knows when I might run across it. I was able to order the first book in Jill McGown's series through ILL. We'll see if it comes. Sometimes other libraries don't want to send older books out. Long before the television show, Hazel was a single panel cartoon. I did think of both the comic and the TV show about Hazel at some point while reading the book, Kay. Not similar characters at all but the maid does play an important part in the story. I did not have time to look into how easy it is to get a copy without spending too much money, but I imagine they are not too easy to find. I am very glad you were able to locate the first book in the Jill McGown series, and I hope it comes through. Each of the books is different, but with continuing characters, and the first one is a good introduction. Thanks for the nod. Seems you found a better one than I, but that could be just a matter of taste. This one surely sounds good, the setting, characters, over-all venue of writers, Hollywood, all of it. Plus: Dell Mapbacks, aren't they great? I've kinda sorta sworn off buying books from Forgotten Book posts (already so many books here!) but I'll make an except for this, if I can find it. Found a "good" copy. We'll see. Thanks, Rick. I did not want to overpraise the book, because it really does depend on taste. But I did like the writing. I hope you like it. A new author is always a gamble. A belated Happy Birthday, Tracy! This book really sounds appealing. I like the setup, and the mix of personalities sounds great. I can see why you liked this as well as you did. Thanks, Margot. I took a few days off work and had a long weekend so it was very nice. In addition to everything else I liked about the book, the setting was interesting. 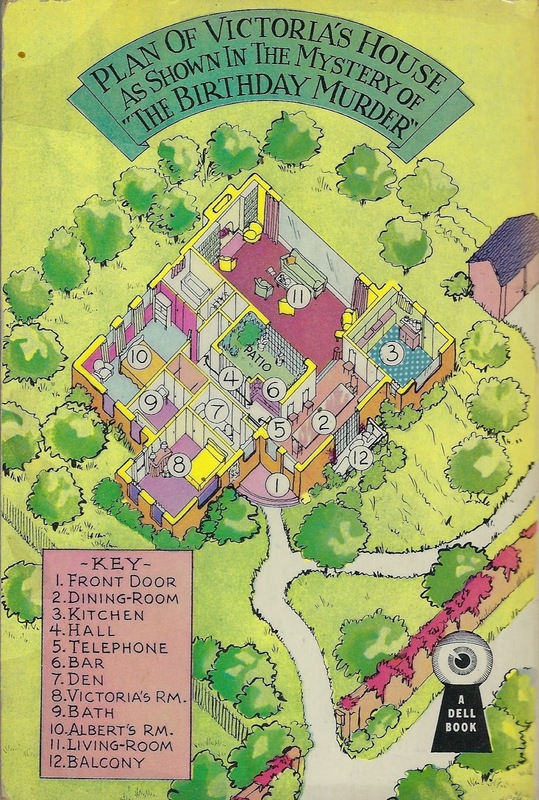 I would read this just for the fantastic diagram of the house! I agree, Debbie. I always like to see house diagrams like this when I read a mystery. Sounds like one helluva hoot! Gotta love that cover, too. Happy birthday belatedly! It was fun and entertaining, Matt, at least for me. This is a book I bought mainly for the cover and I did not expect to like it this much. And thanks for the birthday wishes. I am planning to search out more books by Lange Lewis, Moira. They seems to be easy enough to find and not too expensive. Belated Happy Birthday, Tracy! I hope you have a wonderful year ahead and some great reading too. I went off grid due to the Diwali holidays, the Festival of Lights (and shopping, visiting family and friends, eating sweets and firing crackers). I remember you talking about Diwali before, Prashant. It sounds like fun. Glad to see you back.